$8 tickets on sale here- comedy-anodyne.eventbrite.com or $12 at the door. AJ Grill – a standup comedian currently residing in Milwaukee, Wisconsin. An Iowa native, AJ started his comedy journey at the age of 21 while attending college in Iowa City, Iowa. After moving to central Wisconsin to finish a meaningless bachelors degree, AJ continued to develop his craft working clubs, colleges, and bars all before graduating from college in 2015. AJ Returned to Iowa and won the 2016 Penguins Comedy Club ‘Funniest Person in Iowa Contest.’ He has performed at festivals all over the country including the Cream City Comedy Festival, Cape Fear Comedy Festival, and the Memphis Comedy festival. His comedy is a mix of humorous personal tragedy, silly wordplay, sprinkled with the occasional rant about respecting large bodies of fresh water. Carter Deems – a standup comic/battle rapper living in Milwaukee, WI. He was on the writing staff of the TBS show Drop The Mic and his online vids have over 4 million views. He has also appeared on Funny Or Die, Snoop Dogg’s Gladiator School, and Animation Sandwich. He has performed at the Comedy Store, UCB Theatre and the Cinder Block Comedy Festival. He owns two microwaves. 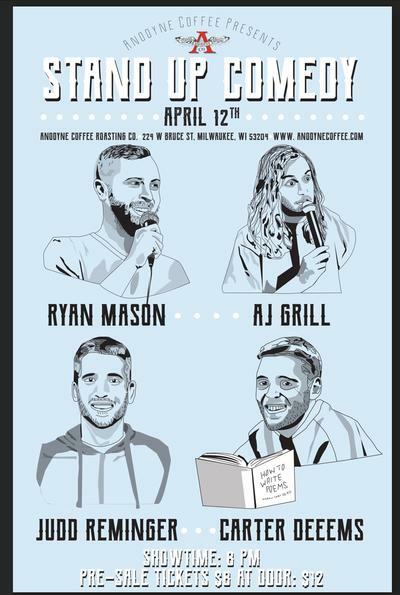 Ryan Mason – A veteran of the Milwaukee comedy scene, Ryan Mason’s comedy touches on his own experiences as a parent and interpretations of everyday absurdities. He is the winner of the Milwaukee’s Midwest Stand-up Competition and runner up in the Milwaukee Battle Royale Comedy Contest. Ryan has featured for some of the biggest names in comedy including Dennis Miller, Kumail Nanjiani, Brian Posehn, Joe Mande, Kevin Bozeman and Morgan Murphy. He has performed throughout the Midwest and United States in all kinds of theaters, festivals and clubs. Ryan has also served as a house comedian for many of the major venues in Milwaukee including the historic Riverside Theater and Turner Hall. Judd Reminger – a stand up comedian residing Milwaukee, Wisconsin telling jokes around the city’s various bars and comedy clubs. Performed comedy in the Midwest, East-coast and Hollywood’s “The Mint”. Judd’s style of comedy is one of outrageous stories, corny short jokes and self-proclaimed narcissist. Off stage Judd hobbies include: Bouncer at Forever 21, Ghost Writer for Palm Readers and coaching his fantasy WNBA team. He has had two plastic surgeries in his face, just trying to Keep Up With The Kardashians. With strong opinions on unicorns and trying to convince people that he knew the whole time the Hannah Montana was just Miley Cyrus in a wig, he is a sure to bring laughs.